In case you missed the opportunity for free park admission, Tuesday was the National Park Service's 99th birthday — and what better way to celebration than with some unusual National Park Service facts? Nature lovers and history buffs probably know all there is to know about the NPS and its history, but for most of us, the national parks are places we got dragged to for family vacations. But the parks are so much more than places for your dad to show off his trivia knowledge and pretend he knows how to camp. Aug. 25 celebrated 99 years of preserving nature, memorializing history, and advocating for education and conservation throughout the country. There are over 408 properties associated with the NPS in the United States, and each offers up its own fascinating history. To gear up for their birthday, the NPS is sponsoring a #FindYourPark initiative, which includes a list of 99 activities and things to do in a national park, from dancing to taking selfies. But in case you need some motivation to visit one of the 58 parks or 305 memorials, here are nine interesting and unexpected NPS facts that you might not learn on your average tour. Yellowstone National Park holds the distinction of being the first ever national park, created in 1872 by Ulysses S. Grant. While it's the first to hold the title, it's not the first protected area. In 1832, way before Yellowstone was created, the Hot Springs area in Arkansas was named a special reservation by Andrew Jackson. It's considered the oldest area in the park service, even though it didn't actually become a national park until 1921. 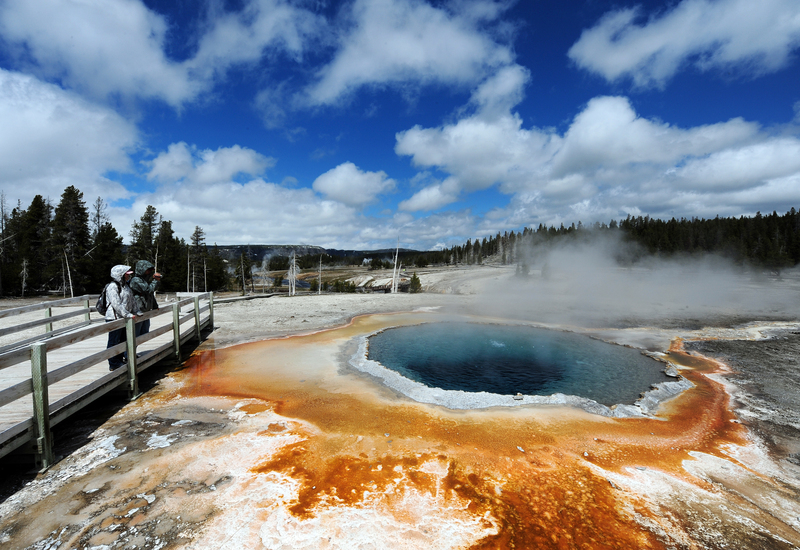 It's not news that people throw weird things into the famous geyser at Yellowstone. But in 1887 a family decided to experiment, and threw their laundry into Old Faithful to see if the boiling waters and pressure would clean their clothes. Apparently it did a pretty good job, as the clothes came back nice and clean. For the record, the NPS discourages people to use the national parks as laundry facilities. The largest tree in the world is believed to be the General Sherman tree, which is found in the Sequoia and Kings Canyon National Parks. It's named after Confederate Gen. William Tecumseh Sherman, and lives pretty close to the Gen. Grant tree, named after Ulysses S. Grant. The Grant tree is also one of the largest trees in the world — the park actually contains several of the world's largest trees, which boast names such as Lincoln and Robert E. Lee. Okay, so that's not true. But it is true that Delaware was the last state to get any national parks or monuments. Which was a low blow, considering that several U.S. territories have national parks. But in 2013, the state got its first national monument, when President Obama created the First State National Monument. And in 2014, it received the First State National Park. So now Delaware is part of the family. Located in New York, the Women's Rights National Park is housed in Seneca Falls, the location of the 1848 women's rights convention. The park, which celebrates famous suffragists such as Elizabeth Cady Stanton, was created in 1840. Anyone looking to celebrate National Women's Equality Day (Aug. 26), might find a visit to this national park particularly illuminating. Both George W. Bush and Bill Clinton have monuments commemorating their childhood homes — visitors can actually visit the real structures in order to tour them. Which is really cool, considering many national monuments are tributes to presidents who are long dead and (sometimes) forgotten. No word on if and when President Obama's childhood home will be made into a monument, but I'm personally looking forward to it. One more reason to go to Hawaii. Despite bearing the likeness of four presidents, Mount Rushmore is named after New York lawyer Charles Rushmore. The original name of the mountain, before it was "discovered" in 1885 was Six Grandfathers, as named by the Lakota Sioux tribe. Which sounds like a way better name for the mountain (especially if they had included two more presidents). The national memorial, which is located in South Dakota, was carved between 1927 and 1941, and is one of the most popular national monuments in the NPS. It's true, national parks predate the NPS by a long shot. For a long time, the protected lands were under the jurisdiction of several different government agencies, most notably the U.S. Cavalry. The NPS as we know it wasn't founded until 1916. In an homage to their earlier roots though, the traditional park ranger outfit is adapted from the cavalry uniform — most notably, the wide brimmed hat. And he loved them. There are more national parks and monuments named after Roosevelt than any other American. And for good reason — Roosevelt loved the parks, and did a lot to advance their work. While president, he established five national parks, in addition to signing the Antiquities Act, which established 18 memorials. He had a ranch in North Dakota, and really loved bison.